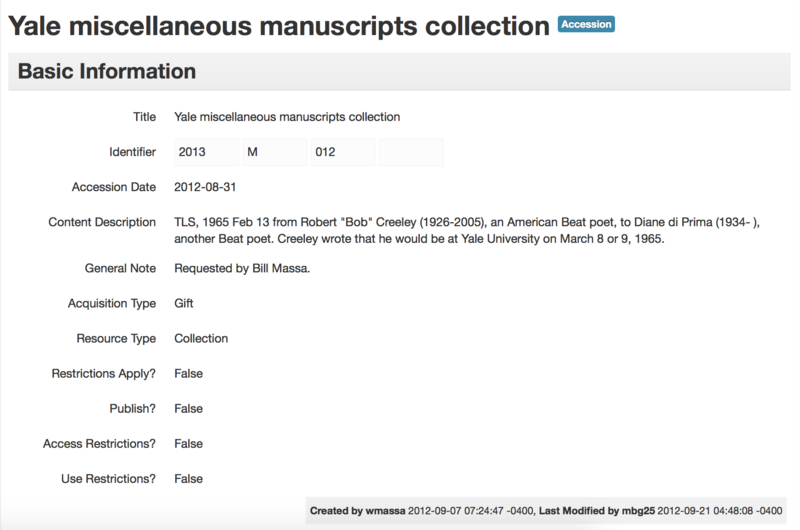 After a couple of years of planning and countless hours of discussions, compromises, development and testing, the first seven of Yale University’s nine ArchivesSpace repositories went live on Monday May 11. The committee finalized (well mostly) our policies and procedures; the controlled values lists; and the system configuration. Maureen Callahan and Mark Custer (aka the dynamic duo), with welcome assistance from Mike Rush, Adam Shahrani, and the folks at Hudson Molonglo ran several test migrations and methodically worked through data errors, developed and ran pre- and post- migration scripts and SQL updates, and finalized the workflows that will be undertaken for the next two migrations (the largest). I am hoping Maureen and Mark will share more of about their experiences with migration in a future blog post. Rachel Chatalbash and Mary Caldera took the lead on finishing up the Yale ArchivesSpace User Manual and handling logistics for the training sessions. We ran into system performance issues during the test run, so Steve DiSorbo (with help from Mark Triggs) worked overtime to give us more computing power and optimized performance. It worked, and our first training session (18 folks from 7 repositories with two teachers and two floats) went without a hitch. We have several more regular sessions scheduled and will follow up with forums and special topic training in the summer. Development continues as our IT team, Melissa Wisner, Yue Ji, and Steelson Smith finalize the programs that will allow automated locations updates and integration with Aeon. Both are requirements for the last two repositories. It’s a work in progress and we’ll wait until we are all in production before we really CELEBRATE, but thanks to the Yale special collections community, the ArchivesSpace community, and all the others who provided support and assistance throughout the process. If you’ve already migrated from Archivists’ Toolkit to ArchivesSpace, you know that timestamps on your records will be reset to the time of migration, and the name associated with the creator of the record will be changed to “admin.” Here at Yale, since accessioning is such a serious activity (after all, it’s the moment when we take legal, physical, and intellectual control of records), we wanted to keep that information in ArchivesSpace. At this time, we’re fine for only having this for accession records, although this technique could be modified for other records, too. This was a project for Adam Shahrani, Mark Custer, and myself. And basically, with Adam’s patient assistance, we just wrote a SQL script to select cognate values from Archivists’ Toolkit and ArchivesSpace, and update the ASpace values with AT values. The script for that is here, on GitHub. All relevant warnings apply. Obviously, you’ll need to update schema names. The other thing is that we did this in an environment where both databases were on the same server (localhost). Doing this update across servers would be more complicated. Check out those sweet timestamps from 2012!